Sometimes when I'm laying on my back on my yoga mat, for a fraction of a second, I can feel you in the room. I can see you in the corner of my eye, walking up to see what I'm doing. I can feel your little nose give my closed eyes a kiss. And it's the very best fraction of a second, my baby bunny. 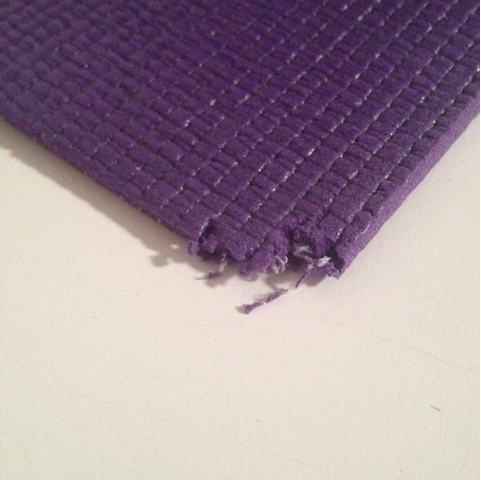 I use the same yoga mat that you chewed when you were little. I desperately need an upgrade to a thicker mat. And perhaps I'll buy one this year, finally. But I'll never get rid of or stop using this trusty old mat that I consider ours. Together. Because we both tried to figure out the world in downward dog on this purple thing. I hope no matter where I go in this world, I always get to feel you doing yoga with me for the very best fraction of a second in any day!